Yes, it’s a thing, and — lucky us! — the Seattle area has a really good place to try it. I SCREAM, YOU SCREAM, we all scream for ice cream, but nobody was screaming for it to get an upgrade. If the idea of a new format involving time-consuming fancy-preparation footwork — with a jump in price to match — fills you with get-off-my-lawn, I understand. When I first heard about rolled ice cream, I rolled my eyes. 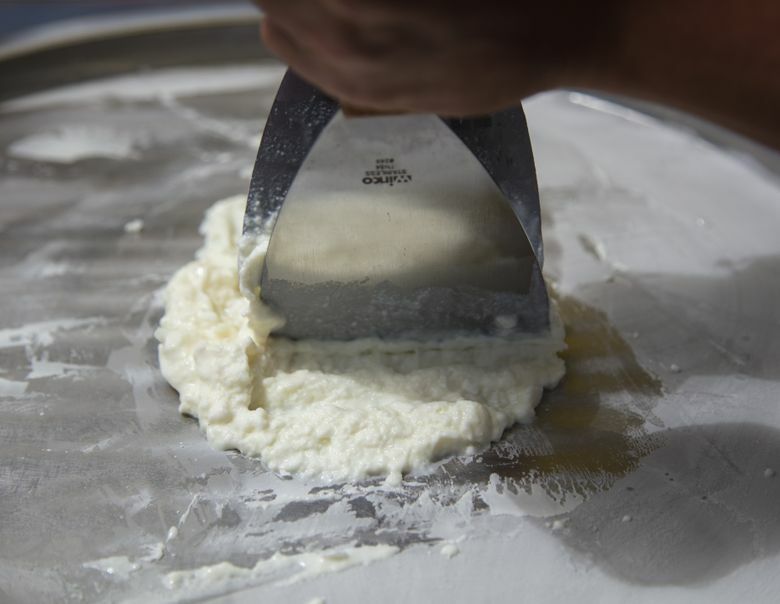 Does it taste better than our old friend unrolled ice cream? I thought it’d be airier in texture, feathery sweet-light. Not so much. It’s good! I mean, it’s ice cream. But the rolling doesn’t magically transform it. Be sure to check sususeattle.com before you go, as events sometimes cause schedule changes. Sundays 10 a.m. to 4 p.m., Fremont Market, North 34th Street and Evanston Avenue (May-October). Wednesdays 2 p.m. to 7 p.m., Kirkland Wednesday Market, Marina Park (June-September). Fridays 3 p.m. to 7 p.m., Juanita Friday Market, Juanita Beach Park (June-September). Saturdays 11 a.m. to 4 p.m.,South Lake Union Market, Ninth Avenue and Denny Way (May-September). So why are people lining up for it, far and wide, waiting longer (sometimes a lot longer) and paying more (ditto)? Several factors are at play. First, never underestimate the human desire for novelty — nor, more nobly, humankind’s hopeful curiosity. (Can they make ice cream better?! I must help in the quest to find out!) Then there’s the sad fact that some people need an excuse to eat ice cream. (Ice cream in a fresh format — just to try it — doesn’t count! Maybe not the second time, either.) And the all-powerful internet loves the videos, a perpetual-motion hype-machine. (I can’t find any videos of cats eating rolled ice cream, however. Disappointing.) Likewise, rolled ice cream is an inordinately Instagrammable treat (44,317 posts right now and counting!). 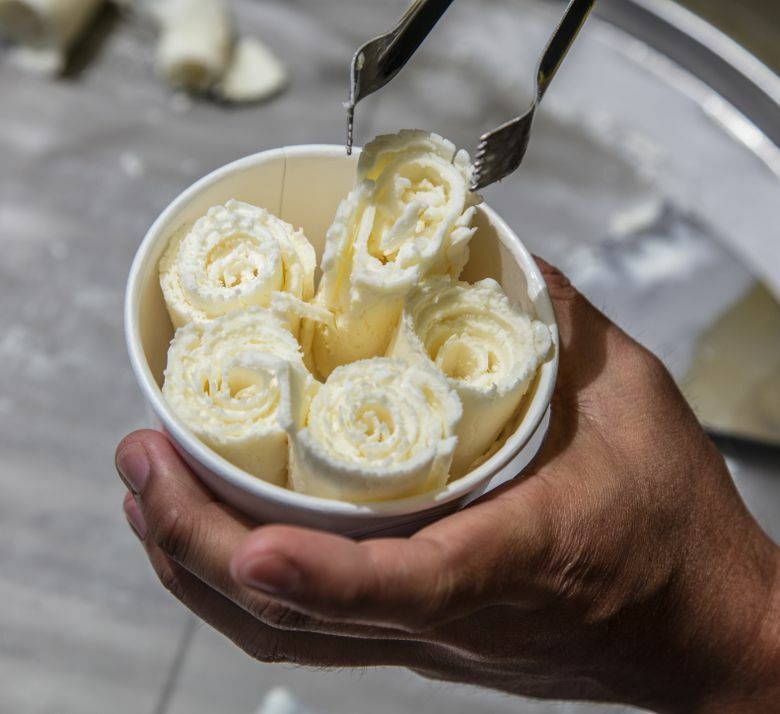 Regarding the internet and Instagram, though: Rolled ice cream is popular there for very human, nondigital reasons, namely because it’s oddly fascinating to watch it being made, and the end result is rather lovely. So we’re essentially talking about a little performance art plus a heightened aesthetic — that is, making ice cream prettier and more fun. Who cares if it tastes better?! Well, guess what, Seattle and the Eastside? 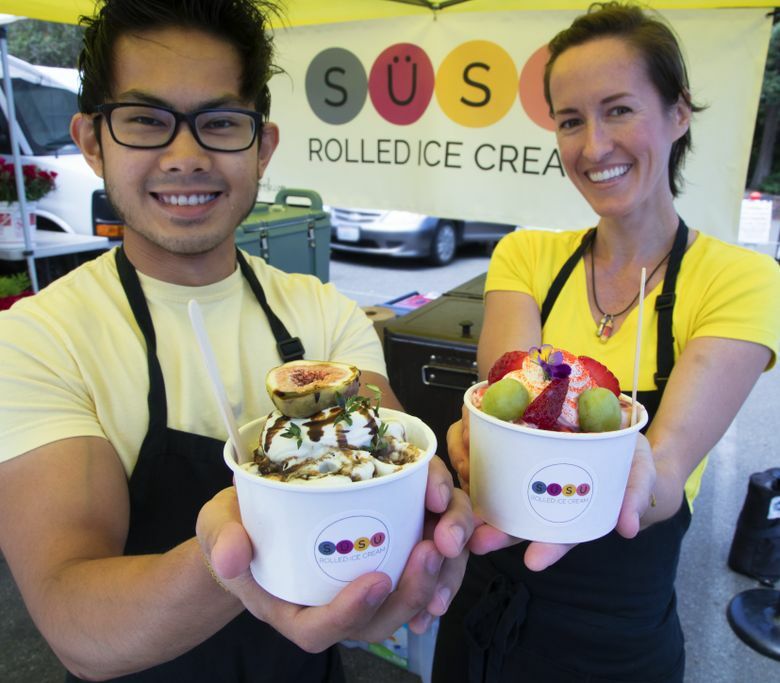 Our rolled ice cream does taste better, at least at the local mobile operation SÜSU. 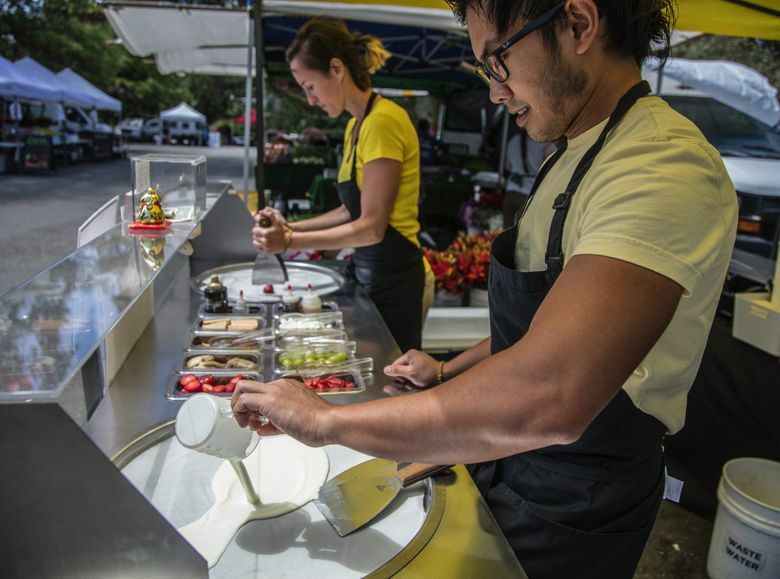 That’s because SÜSU makes great ice cream in general, with carefully sourced ingredients and ambitious, interesting flavors. 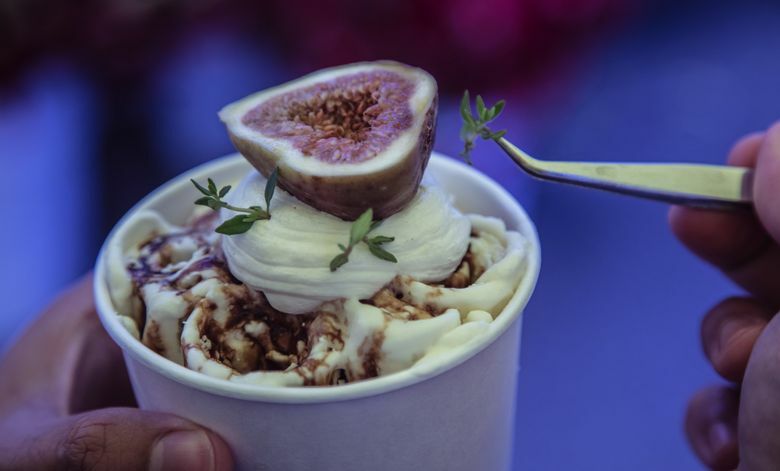 Co-owner Katie Pohl points out that some other rolled-ice-cream outfits don’t even make their own base — they just pour on premade soft-serve mix. This is not remotely acceptable to co-owner/chef Muhammad Fairoz A. Rashed, who brings real-deal culinary chops to the rolled-ice-cream table. He’s worked in Michelin-starred restaurants in France; he’ll talk about inspiration for an ingredient combination coming from his time working with pastry chef Andrés Lara at the Regent Hotel Singapore. SÜSU changes up its menu every two to three weeks. (They used to switch up more frequently but, Rashed says, not everyone got to try all the flavors they wanted to.) When I went to see them recently at the Kirkland Wednesday Market, they had the likes of The Hungry Goat, goat-cheese ice cream with lovely sweet-tart balsamic reduction plus a half-fig, and Durian King, with shortbread, mozzarella and a not-too-pungent hit of the famously stinky fruit. If that sounds too weird for you (or for the kids), never fear: Flavors like Strawberry ♥ Grape and S’mores Fun also await. Yes, it’s $7 a dish, but each one is “a work of art,” as one fan put it, and the servings are generous enough to share. If you go, though, be prepared to wait. The first time I tried, at the Saturday South Lake Union Market, the line stretched so far into the distance of the adjoining park, I gave up. But their longest line to date (they started rolling last June) was at the S.L.U. Solstice Night Market. People waited more than two hours for SÜSU. “When it started raining,” Pohl says, “people just popped out their umbrellas.” By the time they got their rolled ice cream, were they still happy about it? “Yes!” she says. Steve Ringman is a Times staff photographer.